The book was interesting to read. Some readers found that it was easy to read, but others found it deep and insightful. The book highlighted how selective memory can be and how we prefer to remember the good and filter out or “colour” the others. The main character Tony Webster seems remote from emotions as an adult, very little passion for living though he had been passionate about Veronica. The Sense of an Ending is a very apt title. 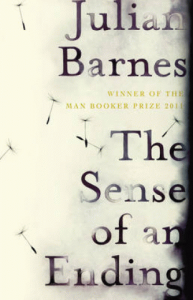 This entry was posted in Book Reviews and tagged Julian Barnes, Parramatta City Library, The sense of an ending by admin. Bookmark the permalink.